MANILA, Philippines – Guess who wants to amend “e-martial law”? Senator Ferdinand “Bongbong” Marcos Jr filed a bill seeking to scrap the provision imposing a penalty for online libel higher than that imposed for libel committed through print and broadcast media. “The Internet, particularly social media, is the closest thing we have to [the] Athenian brand of democracy, where everyone can speak his mind freely. I think the Senate should give a high priority to bills seeking to protect freedom of expression in cyberspace,” Marcos said in a statement on Wednesday, February 19. Marcos objected to the provision in the anti-cybercrime law that imposed a higher penalty for cybercrimes compared to crimes defined under the Revised Penal Code and special laws. 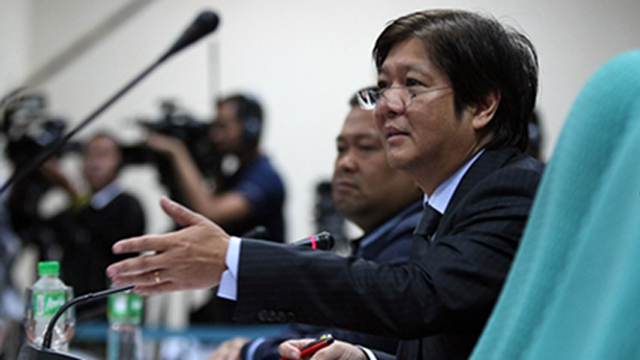 “If a crime is committed by, through, and with the use of information and communications technologies, then the penalties provided under the present laws should be imposed accordingly and should not be increased solely on the ground that the crime was perpetrated through the use of cyberspace,” Marcos said. Marcos issued the statement a day after the Supreme Court upheld most provisions of the cybercrime law. The Court struck down the provision allowing the justice department to take down online content without a court warrant, and that allowing the real-time collection of traffic data. Netizens and some lawmakers hailed the decision against the two controversial provisions but expressed disappointment that the Court upheld online libel as a crime. Marcos was among the senators who voted to pass the law. The others were Pia Cayetano, Jinggoy Estrada, Francis Escudero, Gregorio Honasan II, Panfilo Lacson, Manuel Lapid, Loren Legarda, Aquilino “Koko” Pimentel III, Ralph Recto, Ramon Revilla Jr, Vicente Sotto III, and Manuel Villar Jr. The senators admitted that the questionable provisions “slipped past” them. The lone senator who voted against the law, Teofisto “TG” Guingona III, refused to comment on the Court ruling until he reads the entire decision. The Supreme Court decision renewed the call of activists and journalists to decriminalize libel, meaning remove the penalty of imprisonment. Senator Juan Edgardo Angara, an author of the cybercrime law in the House when he was Aurora representative, said online libel is necessary but offenders must not be imprisoned. Angara again pushed for his bill seeking to amend Article 355 of the Revised Penal Code, which penalizes those found guilty of libel with 6 months to 4 years imprisonment or a fine ranging from P200 to P6,000. “In a country where democracy is primarily infringed on the freedom of speech and expression, in a State where the media is considered the fourth state, it is a sad reality that existing laws on libel have not been attuned to the evolving needs of the people under a democratic rule and the rising importance of media in effecting transparency and accountability in governance,” Angara said. Senator Francis Escudero filed a similar bill. Human rights lawyers and international groups like the United Nations Human Rights Council urged the Philippines to decriminalize libel, saying the prison penalty is excessive and violates freedom of expression. Yet the leader of the Senate does not see any need to amend the cybercrime law’s online libel provision. Senate President Franklin Drilon, a former justice secretary, said judges do not impose the penalty of imprisonment in libel cases anyway. “In libel cases, the judges would not impose prison terms because there is an alternative, imprisonment or fine, again subject to confirmation. My understanding is that libel as a crime would not call for imposition of a prison term,” he said. The Senate President refused to weigh in on the free speech and free expression debate. President Benigno Aquino III on Wednesday said curbing freedom of expression is not the intent of the cybercrime law, and that the Internet, as a medium, should not be given special treatment compared to other media. “So if there’s something wrong in what you say on TV or radio, or what you write in newspapers or magazines, if you move formats, should you be exempted? I don’t think you would agree with that. Why? Because that gives unequal protection to violators,” he said.